On listening to the promise of Srinivasa, Vakula Devi is determined to have a talk with Akasa Raju and his wife Dharani Devi and arrange the marriage of Srinivasa and Padmavati. So she visits the palace. Meanwhile, Srinivasa visits the palace in the disguise of Yerukala Sani. Srinivasa in the disguise of Yerukala Sani meets Akasa Raju, his wife and Padmavati and says that the person who rescued Padmavati from the wild elephant and to whom the princess lost Her heart, is no ordinary man but is Lord Vishnu Himself in the form of Srinivasa. And also tells that an old lady named Vakula Devi is coming to propose for the marriage. Saying so, Srinivasa disappears from the scene when Vakula Devi enters. She is welcomed warmly by Akasa Raju and his wife who agrees for the marriage proposal without any hesitation. Thus Akasa Raju starts preparations for the divine wedding. Vakula Devi being a saint has no money to meet the marriage expenses. Hence Lord Srinivasa borrows huge amount from Kubera - the Hindu god of wealth and promises to repay the amount with interest (vaddi in Telugu). To keep His promise given to Kubera, Lord Srinivasa seeks His devotees to offer coins in order to keep repaying Kubera, along with interest. Hence Srinivasa is called 'vaddi kasula vadu' in Telugu which means the one who takes currency coins along with interest. Thus Srinivasa Padmavati Kalyanam i.e marriage is performed in the grandest way. All the gods witness the divine marriage and bless the newly wed divine couple. There is a small diversion in the story at this point. I came to know about this from my parents / grandparents. As per Telugu custom, the parents of the newly wed bride send all the required stuff (known as 'puttinti sare' in Telugu language) which include foods, utensils etc along with the bride when she goes to her in-laws house along with her husband immediately after marriage. This is known as 'bidai' in Hindi, it's a send-off. Akasaraju sent his newly wed daughter Padmavati along with 'sare'. It is believed that the newly wed divine couple were advised by Sage Agastya to stay downhills for nearly 6 months. Accordingly, Lord Venkateswara along with Padmavati Ammavaru halted in a place. The place which is at a distance of around 12 Km from Tirupati (downhills) became popular as Srinivasa Mangapuram. There is a replica of Lord Venkateswara Swamy's idol in the Kalyana Venkateswara temple at this place. The party resumed their onward journey to Tirumala. While they were moving in a procession, just for the sake of kidding, Lord Venkateswara Swamy said to Padmavati, "Dear, your parents have given everything but forgot to give curry leaves which are very important for preparing curries. Padmavati feels insulted, takes it seriously and She refuses to accompany Lord Venkateswara. The infuriated / insulted Padmavati leaves to Tiruchanur (Alivelu / Alamelu Mangapuram) and settles at this place though Lord Venkateswara pleads Her to get back. That's the reason why Padmavati Ammavaru's temple is in the downhills at Tiruchanur. This is just a story and there is not mentioned in Puranas. According to Puranas, while the newly wed divine couple enjoy their time, the divine news reporter - Sage Narada reports the matter to Goddess Lakshmi Devi who resides in Kolhapur (in Maharashtra). On hearing the news, Lakshmi Devi gets furious and rushes to Tirumala Hills. On seeing Padmavati who takes Her position (as Lord Vishnu's i.e Venkateswara's wife), Lakshmi Devi starts fighting with Padmavati. 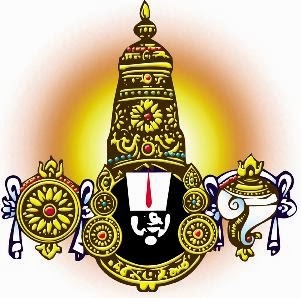 As a typical humanly woman nature, while the two divine ladies are involved in verbal attack / fight for their right (their husband), Lord Venkateswara steps back and transforms Himself into a shining statue made of black stone (the present idol of Lord Venkateswara Swamy in Tirumala). The two divine women are shocked on seeing this transformation in their husband. Unable to digest the situation, Padmavati and Lakshmi Devi also transform themselves into gold impressions and remain in the heart i.e chest region of Lord Venkateswara's idol. Thus, Lord Vishnu and Lakshmi Devi re-unite and get back to Vaikuntham. While Lord Venkateswara resides in Tirumala in the form of black statue to bless His devotees. Hence, the place is known as 'Kaliyuga Vaikuntham'.